It’s hard to say goodbye to a favorite pair of jeans. Even when they’re covered in stains and fraying at the seams, throwing out a pair of worn-in blue jeans is a heartbreaking experience that we’ve all been through. Even though all jeans will inevitably fade and fray, there are things you can do with your old jeans to memorialize them and turn them into something fun and new. For instance, you can turn your old jeans into cute denim coasters, or if you’re constantly expanding your handbag collection like me, you can transform your denim into a DIY jean bag! If you know the basics of sewing, then this jean bag is so easy to make. All you need is your favorite pair of old jeans, a sewing kit, and a few other basic materials, and your jean bag will be ready for a night on the town in no time! Check out the materials and instructions below, then watch the video to learn how to transform your jeans into a handbag. Use a ruler and chalk to draw two straight lines across the crotch line of a pair of old jeans. Cut across the chalk lines to remove the pant legs. Turn the rest of the jeans inside out, then sew them shut and flip back. Iron the sewed edge of the jeans. Draw a square around the pants button, then cut it out and sew the waist together. Sew the button to the back waist, aligning with the button hole. 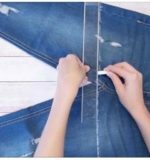 Use the chalk and ruler to draw a straight line on the pant legs, then cut on the lines to make a strap for your jean bag. Separate the straps into two pieces of fabric, then sew them together. Sew the strap to the left and right sides of your jean bag, near the belt loops. Make sure to SHARE this on Facebook with someone who has a lot of old jeans lying around!